Our selection of Jerseys was made because of the sweet nature of Jersey cows and the fact they produce the highest quality milk with the highest butterfat content. 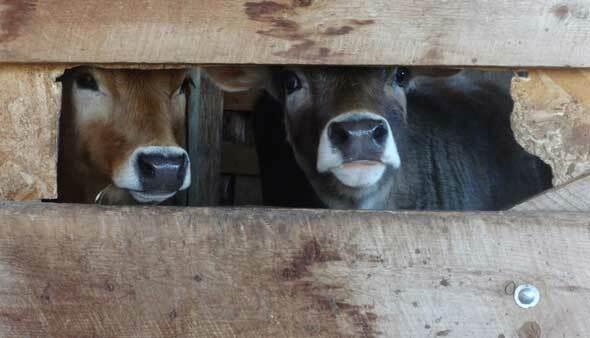 We run A2 Jersey cows and provide raw milk, cream, yogurt and cheese on a weekly basis. 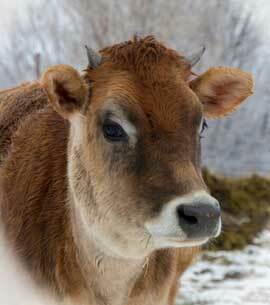 Our lead cow, Ginger, can literally be milked in the field without any feed or even tying her up. One can just throw down a bucket and milk her without any fuss. Jerseys are excellent mothers but some take it to extremes. 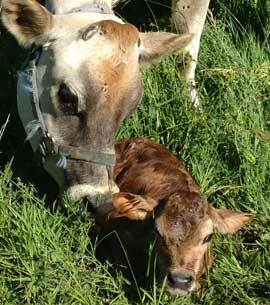 Ginger’s first calf, Casilda, has always taken the role of babysitter for all the calves. If the calves are sleeping in the pasture, Casilda will be right there watching over them while the other mothers are off grazing. 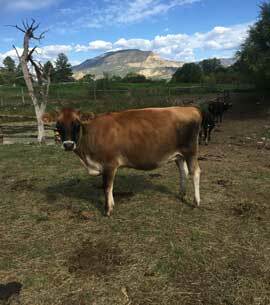 The one and only time we ever had a disease problem was when Casilda got mastitis, an infection in one quarter of her udder. She continued to feed her calf despite being quite sick and assuredly suffering. Fortunately, Enzo Nastati was here at the time and he made a homeopathic preparation for Casilda, who was so weak she couldn’t stand nor lift her head and was clearly dying. I was instructed to spray the prep in Casilda’s mouth every 5 hours for 48 hours. After the first 24 hours, Casilda was up and visibly looked much better. In 48 hours she was mainly back to normal and she fully recovered within 10 days. But through the entire ordeal, Casilda managed to feed her baby! 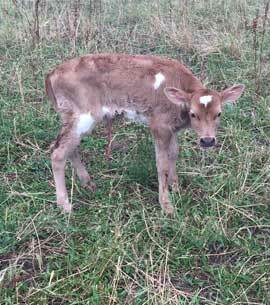 My first Jersey milk cow is Ginger. I bought her from a local small dairy already bred. She had Casilda the following spring, we began milking just for ourselves, and therein began the slow progression toward a cow share dairy. I bought a Jersey bull for Ginger and Casilda and a few of years later both were calving. Since then I bought Nicolasa, an A2 Jersey cross, and Bean, my current A2 Jersey bull, from Nebraska as babies. We raised them up and now Bean is breeding all the cows in my herd and also is sired out to other cows. We currently have 4 cows on line milking. We have 4 more heifers who will be bred and come on line over the next 2 years. And that’s the progression how the herd grows. The cows that are being milked now are slowly being bred again. Two to three months before they are due to calve (9-month gestation period) we will dry them up (stop milking them) so they can rest and put all their energy into the new babies. Once new calves are born, we leave them with their moms for at least 2 weeks without milking them. Then we slowly begin milking them in the mornings. We only milk once a day because we want the babies with their mothers all day every day. Often we will leave a nurse cow with the babies at night so they have milk to drink - at least until they are several months old and have started eating grass or hay themselves. If Casilda has calved, she’s the obvious choice because she loves being with the babies and will feed all of them graciously. We are very fortunate that all our cows are happy to feed one another’s calves if their own mother is not with them. 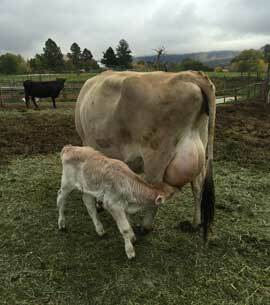 The one time we had a problem with Casilda getting mastitis, Ginger readily took on Casilda’s calf for several days to give Casilda a break. 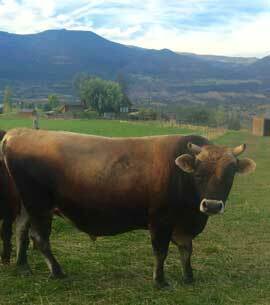 We keep the horns on all our cows to assure their optimum health. Far from being an unneeded appendage, horns actually are connected to the cow’s digestive system. When one observes a cow in their natural habitat, you quickly realize that they are the very essence of digestion. Having 4 stomachs and recirculating their fodder over and over again, the cow is the archetype for metabolism. The end product, their manure, is the highest level of sustenance for the earth. But less obvious parts of their metabolic system are their hooves, their horns, and their tail end. Cows draw cosmic substances from the sun through their horns. The horns are actually sense organs just as are their eyes, ears, tongues, etc. The forces coming into the cow through their horns are then radiated back up again by their hooves. Whilst the sun forces enter from the horn end of the cow, lunar forces enter from the tail end providing a perfect balance to their entire being. Evidence of this can be seen when observing the cows at different times of the year or in different health conditions. They will literally turn themselves so that their head and tail ends are facing the opposite direction when conditions warrant it. There are cases when an illness was cured by simply turning the cow around in the barn. We can schedule tours of the dairy, introduce you to the cows, and give full explanations of our management operation. Learn why we run Jerseys, what A2 cattle are, how we have adapted the dairy to increase the vitality of the milk using homeodynamic principles, and how the dairy and the cattle move through the seasons. 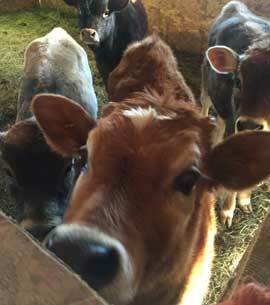 If you are interested in applying to become a shareholder, please visit our Cow Shares page.